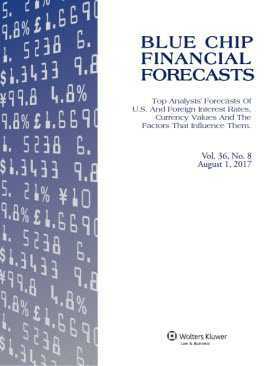 Blue Chip Financial Forecasts also contains forecasts of 3-month interest rates, 10-year government bond yields and foreign exchange rates for the U.S., U.K., Japan, Switzerland, Canada, Australia and Euro, based on a separate survey of respected international firms. Commentary: Analysis by newsletter's staff of latest survey results and recent U.S. and international economic and financial developments. Graphs: Plot historical data and consensus forecasts. Long-Range Forecasts: In June and December, consensus, and averages of top 10 and bottom 10 forecasts of all regular variables for each of the next five years, plus an average for the following 5-year period. Databank: Two years of historical data on 28 critical indicators of business activity. Calendar: A calendar of upcoming government and private sector data releases, Federal Reserve meetings, etc. Archival issues – 1982+ (PDF) and 2001+ (Excel) - are also available. Call 1-800-638-8437 for more information.